Climate change is continuing globally and in Europe. Land and sea temperatures are increasing; precipitation patterns are changing, generally making wet regions in Europe wetter, particularly in winter, and dry regions drier, particularly in summer; sea ice extent, glacier volume and snow cover are decreasing; sea levels are rising; and climate-related extremes such as heat waves, heavy precipitation and droughts are increasing in frequency and intensity in many regions. New record levels of some climatic variables have been established in recent years, notably global and European temperature in 2014 and again in 2015, global sea level in 2015 and winter Arctic sea ice extent in 2016. Some climatic changes have accelerated in recent decades, such as global sea level rise and the decline of the polar ice sheets. Global climate change has substantially increased the probability of various recent extreme weather and climate events in Europe. The reliability of this finding has been strengthened by recent progress in extreme weather attribution techniques. Climate change will continue for many decades to come. Improved climate projections provide further evidence that future climate change will increase climate-related extremes (e.g. heat waves, heavy precipitation, droughts, top wind speeds and storm surges) in many European regions. The observed changes in climate are already having wide-ranging impacts on ecosystems, economic sectors and human health and well-being in Europe. Recent studies show that various observed changes in the environment and society, such as changes in forest species, the establishment of invasive alien species and disease outbreaks, have been caused or enhanced by global climate change. Ecosystems and protected areas are under pressure from climate change and other stressors, such as land use change. The observed impacts of climate change are a threat to biodiversity in Europe, but they also affect forestry, fishery, agriculture and human health. In response to climate change, many land-based animal and plant species are changing their life cycles and are migrating northwards and to higher altitudes; regional extinctions have been observed; various invasive alien species have established themselves or have expanded their range; and various marine species, including commercially important fish stocks, are migrating northwards. Most impacts of climate change across Europe have been adverse, although some impacts have been beneficial. The rise in sea level has increased flood risks and contributed to erosion along European coasts. The observed increase in heat waves has had significant effects on human health, in particular in cities. Heat waves are also increasing the risk of electricity blackouts and forest fires. Transport and tourism have also been affected by climate change, with large regional differences. Examples of beneficial impacts of climate change include a decrease in heating demand and some benefits to agriculture in northern Europe. 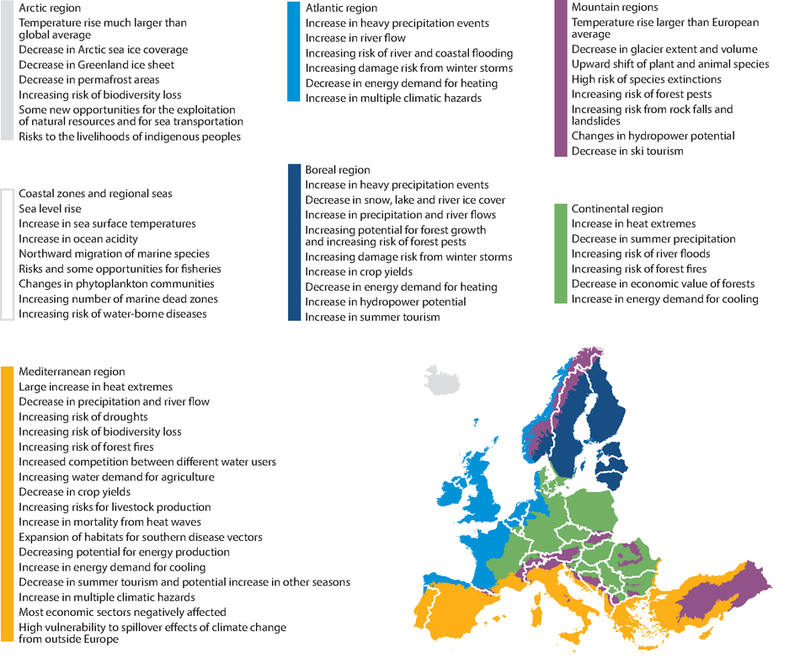 Climate change is affecting all regions in Europe, but the impacts are not uniform. South-eastern and southern Europe are projected to be hotspot regions, having the highest numbers of severely affected sectors and domains. Coastal areas and floodplains in the western parts of Europe are also multi-sectoral hotspots. The Alps and the Iberian Peninsula are additional hotspots for ecosystems and their services. Ecosystems and human activities in the Arctic will be strongly affected owing to the particularly fast increase in air and sea temperatures and the associated melting of land and sea ice. Economic costs can potentially be high, even for modest levels of climate change, and these costs rise significantly for scenarios of greater levels of warming. The projected damage costs from climate change are highest in southern Europe. However, estimates of the projected economic impacts of climate change in Europe consider only some sectors and show considerable uncertainty. Future climate change will interact with other socio-economic developments, including the ageing of the population and increasing urbanisation across Europe, projected decreases in population size in eastern Europe, and a narrowing economic gap between eastern and western parts of Europe. The water sector, agriculture, forestry and biodiversity show strong interdependencies, and are also related to changing land-use patterns and population change. Europe is vulnerable to climate change impacts outside Europe through six major pathways: the trade of agricultural commodities, the trade of non-agricultural commodities, infrastructure and transport, geopolitics and security risks, human mobility related to migration and finance. The strongest evidence for Europe’s vulnerability to cross--border impacts are the economic effects seen as a result of climate-related global price volatilities and disruptions to transportation networks. The Mediterranean area is most vulnerable to shocks in the flow of agricultural commodities, while small, open and highly developed European economies are particularly vulnerable to shocks in the flow of non-agricultural commodities. European vulnerability to cross-border effects is expected to increase in the coming decades, but quantitative projections are not available. The magnitude of future climate change and its impacts from the middle of the century onwards depend on the effectiveness of global climate mitigation efforts. The magnitude of climate change and its impacts can be substantially reduced by an ambitious global mitigation policy compatible with the mitigation goal of the 2015 Paris Agreement under the United Nations Framework Convention on Climate Change (UNFCCC) of keeping the increase in global average temperature to well below 2 °C above pre-industrial levels. Climate change adaptation strategies, policies and actions, including the mainstreaming of them into other policies, are progressing at all governance levels (European Union (EU), transnational, national and local levels). Further actions could include enhancing policy coherence across EU environmental and sectoral policies; effective and efficient action across all levels of governance, through multi-level governance and transnational cooperation platforms; enhancing flexible ‘adaptive management’ approaches; combining technological solutions, ecosystem-based approaches and ‘soft’ measures; involving the private sector; and more emphasis on ‘transformational’ adaptation actions as a complement to ‘incremental’ adaptation. The knowledge base regarding climate change impacts, vulnerability, risk and adaptation assessments in Europe could be enhanced, e.g. through improved monitoring and reporting of climate-related extremes and the associated damage, enhanced national and sectoral assessments and their reporting, and further monitoring, reporting and evaluation of adaptation actions at the national level. More knowledge would also be useful on the costs and benefits of adaptation options and on interdependencies, synergies and trade-offs between adaptation policies and other policies and actions. EU-funded and national research can address adaptation knowledge gaps and stimulate innovation. The use of European, transnational and national climate change and adaptation services by stakeholders could be further improved. The European Commission’s ‘adaptation preparedness scoreboard’, which assesses the progress of Member States using process-based indicators could be complemented by quantitative information. The indicators of the Sendai Framework for Disaster Risk Reduction for weather- and climate-related hazards are expected to be relevant for climate change adaptation. (6) Strengthening the knowledge base. National monitoring, reporting and evaluation of climate change adaptation in Europe This report provides new insights into adaptation monitoring, reporting and evaluation systems at the national level in Europe and constitutes the first attempt to consolidate emerging information across European countries. It aims to offer reliable and targeted information to support the effective and efficient implementation of climate adaptation policies and actions at the national level in Europe. Adaptation of transport to climate change in Europe Challenges and options across transport modes and stakeholders. This report explores current climate change adaptation practices concerning transport across European countries. It provides an overview on the challenges and state adaptation action, a review of a number of initiatives in different countries, and conclusions on a potential way forward. Its purpose is to stimulate discussions among the many different stakeholders concerned with transport adaptation. Opening the perspective on the transport system and sector as a whole should inspire and encourage learning from practices across modes and areas of responsibility and support efforts to mainstream adaptation within transport-related policy and practices. The factual information collected is based on data available in the Climate-ADAPT information platform, a literature review, case studies provided by many stakeholders, and a questionnaire on transport and adaptation addressed to EEA member countries in 2013. For references, please go to https://www.eea.europa.eu/publications/climate-change-impacts-and-vulnerability-2016/key-findings or scan the QR code.